Updated at 3:05 p.m. with Senate vote. 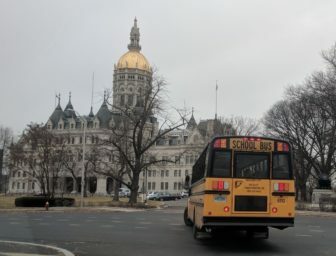 The legislature voted overwhelmingly Wednesday to take a year off from penalizing municipalities that reduce school spending in reaction to cuts in state aid, a change the governor says would affect only two communities. “I don’t get it, to tell you the truth,” Gov. Dannel P. Malloy said. State law requires cities and towns to spend at least as much on education from one year to the next, with a few exceptions for things like declining enrollment. However, the Malloy administration and legislative leaders disagree over whether municipalities can cut spending in response to mid-year cuts in state education aid made for the 2017-18 fiscal year. Municipalities were allowed to cut $30 million to reflect cuts in what the adopted state budget provided their schools. However, that budget also ordered the governor to find another $880 million in cuts from state spending. With municipal aid accounting for such a large share of the budget, Malloy had few places to turn other than education aid and imposed $58 million in midyear cuts for 130 communities last November. Shortly afterward, his education department informed superintendents their districts would lose even more state funding if they compensated by cutting their own education budgets. Six communities were told this winter they faced penalties for cutting too much. The penalty can be twice the amount of any cut deemed excessive. In response, four have moved to increase spending to comply with the department’s directive. (Read about that here.) Malloy said Wednesday only two communities would get relief from the bill, Montville and Canterbury. More districts are not being threatened with penalties because local spending was already on pace to make up for the state cut or because local leaders scrambled and found more local funding after being told they would be required to spend more. The Democratic and Republican leaders of the state Senate and the Republican leader of the state House of Representatives, wrote the State Board of Education last month asking that they exempt towns from what is known as the Minimum Budget Requirement, or MBR. On Wednesday, the House voted 141 to 2 and the Senate 34 to 1 to suspend the minimum spending requirements for the current fiscal year. The bill now moves to the Senate, where passage was expected later in the day.